In a recent PC World article, one of my colleagues suggested that the "Slimmed PS3 Won't Save Sony." Let's play devil's advocate and consider the alternative, which is that it will, with an appended "and then some." Sony just slashed the price of its flagship console by $100, a full 25% drop, significant by any measure. For 300 bones, you can have a Blu-ray playback device with integrated wireless, 1080p HDMI output, a 120GB upgradeable (within warranty) hard drive, and free online multiplayer et al. support. Not too shabby. Sony's has its work cut out, to be sure, but the PS3 Slim knocks the legs out from under the "boutique pricing" caveat. In fact I think the Slim puts Sony back in the game with bells on, whether Microsoft pulls the trigger on a 360 Elite price drop (from $400 to $300) or not. The five-month decline in video game sales is predicted to be in reverse as I type this. According to Wedbush Morgan analyst Michael Pachter's August 10th game sales report, "Beginning in August, we expect a return to monthly software sales growth, with September likely to come in at +30% or higher…We believe that July marks the last month of negative double-digit sales declines, and that video game software sales will rebound in August, with modest upside expected…and expect share prices to recover as investor concerns abate." So the market as a barrier, and the PS3's previous "boutique" price in said market, are probably off the table as attenuating factors if we place stock in Pachter's upbeat forecast. The PS3 is holding its own internationally. In monthly NPD Group retail sales the PlayStation 3 has been "at the bottom of the heap" for some time, but things aren't as bleak as that sounds. In Japan, Sony's got Microsoft by over two million units. In Europe, they're only behind by roughly a million units. Their weak spot's the US, where they're down by nearly nine million units. To catch up to Microsoft by this time next year, they'd need to sell roughly 750,000 units a month on top of breakeven monthly unit sales with the Xbox 360. Obviously not going to happen. But whether we see Microsoft's lead dwindle or grow at this point really depends on consumer reactions to a $300 Xbox 360 Elite. If Microsoft antes up (as expected) the looming holiday season will be definitive in establishing the shape of things between now and generation-twilight (around 2013). 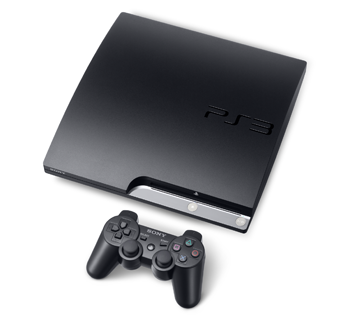 Sony's PS3 "cost to build" had, as of July 2009, dropped by roughly 70 points since the system launched in 2006. GameSpot's estimates are that it costs Sony around $252.10 per unit (down from original launch cost estimates of $840.35 per unit). If that's roughly accurate--packaging, transportation, and miscellaneous costs notwithstanding--there's every reason to believe the $100 price drop won't snap Sony's back. If the Slim sells well, it should be a bottom-line booster, as opposed to a Pyrrhic sales generator. The PS3's system failure rate is virtually nonexistent compared to the Xbox 360's. Forgetting the questionable Game Informer reader survey which pegged Xbox 360 failures at 54% and working off more forgiving retailer estimates, which place Xbox 360 failures at around 33%, that's still a virtually unprecedented failure rate for a game console. To Microsoft's credit, they've taken full ownership of the issue, but if you hate sending units in for repair or debating with a support rep about warranty stipulations, Sony's got Microsoft beat by miles on this point. The PS3 Slim is backward compatible. Sure, the "emotion engine" chip that handled PS2 compatibility in the original 60GB model was yanked, but the PS3 still services Sony's entire back catalogue of PlayStation One games, including: Final Fantasy's 7 through 9, Castlevania: Symphony of the Night, Metal Gear Solid, Vagrant Story, Chrono Chross, Xenogears, Street Fighter Alpha 3, Gran Turismo's 1 and 2, Colony Wars, Rayman 2, Legacy of Kain: Soul Reaver, Grandia, and hundreds (or is that thousands?) more. Should they reinstate the software compatibility option temporarily introduced in European PS3s? I've long thought so--even if the compatibility catalogue (like Microsoft's) is limited--but dismissing the PS1's library completely misses what remains for at least some gamers a major selling point. Losing the option to install other operating system's is irrelevant. There's a minority (not a particularly vocal one) that might tell you otherwise, but the option to throw stuff like Linux onto a PS3 was never really official anyway. And for the mainstream consumer, that sort of "fool-around-with" factor is beneficially nil. The new design takes up less cabinet space and drops your Windex bill. Okay, you probably shouldn't be using an ammonia-based cleaner anywhere near your PS3, but glossy finishes on touchable technology are the devil. In addition to dropping the space and weight footprints by 33 and 36 percent respectively, the Slim has a predominantly matte finish (like the PS2's) keeping unsightly fingerprints and finger-oil-smudging out of the visibility spectrum. The PS3 Slim's "Cell" processor is sized just 45nm, a drop from the original's sizzling 60nm. Sony says this reduces the power consumption from 280 to 250 watts, or 11 percent. The result? Less heat, obviously, which means less fan activity and lower overall decibel levels. Assuming you're not torturing your PS3 by sealing it away in a thick wooden cabinet, heat levels and fan noise that were already reasonably low should now be virtually whisper quiet. It's all about the games, and Sony's fall and holiday 2009 exclusives lineup looks as smart as Microsoft and Nintendo's. Uncharted 2: Among Thieves, Demon's Souls, Tekken 6, and Ratchet & Clank: A Crack in Time for starters. What's more, all those gamers who've never owned a PS3 have Sony's existing exclusives catalogue to sample, so you have to factor stuff like LittleBigPlanet, Metal Gear Solid 4, Killzone 2, Uncharted: Drake's Fortune, Ratchet & Clank Future: Tools of Destruction, Resistance: Fall of Man, BlazBlue: Calamity Trigger, Flower, Wipeout HD, MLB 09: The Show, Valkyria Chronicles, and inFAMOUS when weighing the system's value. Looking forward to 2010, add: White Knight Chronicles, MAG, Gran Turismo 5, Heavy Rain, The Last Guardian, God of War III, and ModNation Racers. The PlayStation Network has as many bells and whistles as Xbox LIVE, depending on your vantage. Online multiplayer, game demos, PlayStation Home, Qore, Pulse, and the garnish on top? All 100% free (UPDATE: Qore is subscription-based--just two episodes are free). Whereas you'll pay $50 a year for Xbox LIVE (factor the composite of six to eight years ownership and you'll pay Microsoft an additional $300-$400). It's easy to overlook the cost of Xbox LIVE Gold at the outset, but add it up, and you're looking at the cost of a second system-plus. And finish. Just remember: No dog in this fight. All three systems have standout games and distinctive features. Cross your fingers they succeed, because Microsoft, Sony, and Nintendo are at this point beholden to millions of gamers, any way you slice it. Something I've missed? Tell me about it--or why you agree/disagree with me--below.